This is a review of the supplement Think Clear. This product contains four top nutrients that help to support memory, brain, and cognitive functions. Think Clear also improves blood circulation, the flow of oxygen, the health of cells, and the transmission of information between cells. You will gain more insight into this product as you continue reading this review. Ginkgo Biloba– Improves the circulation of blood in the brain and the whole body. This ingredient is able to pass through narrow blood vessels, which increases oxygen supply to the body and the brain. Huperzine A– Enhances mental function and maintaining acetylcholine levels. Acetylcholine is a nutrient that enhances cognitive ability. Healthy levels of this nutrient help to maximize memory health. Huperzine A also helps the nervous system to transmit information between cells. Docosahexaenoic Acid (DHA)- Contributes to the formation of retinal and brain tissues. It ensures that blood vessels remain healthy and plays a vital role in responding to inflammation. Users are advised to take one capsule with meals two times per day. This product may also be taken according to the prescription of a health care professional. You should not exceed the prescribed dose. Furthermore pregnant women and breastfeeding mothers should not consume this product without professional advice. The same applies to people with heart attacks, stroke, and those taking blood thinners. This product is for people above 18 years of age. One bottle containing 60 veggie capsules costs $20.49 on the manufacturer’s website. Buyers also get an extra bottle for half the price after purchasing one bottle. Those willing can also join a savings club where they can buy the product at a low price. Overall, the price of this product is relatively low and may cause quality concerns among consumers. We did not find any evidence of a satisfaction guarantee, but this product is certified to guarantee purity, efficiency, and potency. There are a few customer reviews on the company’s website. Although these reviews are positive and signify some level of customer satisfaction, more reviews would definitely attract more consumers to try this product. 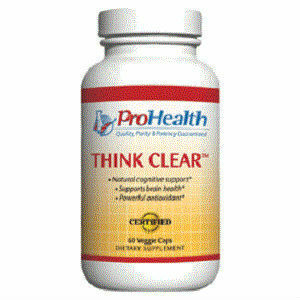 Think Clear is an appropriate product for consumers who need nutrients to support memory, brain, and cognitive functions. It is also an ideal product for people who want to improve blood circulation, the flow of oxygen, and the health of cells. Its benefits include a combination of the right ingredients and a price that most people can afford. However, the low price offered for this product may raise quality issues. Moreover, there is no guarantee that the product will meet the expectations of users. Henry Costa	reviewed ProHealth Think Clear	on June 14th	 and gave it a rating of 3.